Due to a relatively soft spring they really need some internal oil pressure to function right. This means the timing chain is prone to some rattling at cold starts. As the chain gets some free play this can also cause some cogwheel wear. The S52 tensioner has a stronger spring and has a telescopic design making it more closed. These differences ensure more pre-tension at cold starts and most times takes all rattles away, both at cold starts and at high revs. The BMW part # is 11 31 1 405 081. Note: if it doesn’t take away the rattles, or if the engine rattles for longer than a minute on its old tensioner, it is about time to inspect your chain and cogwheels first as they can be worn. If you leave that unattended the chain might skip one day which can cause a major engine damage. Needless to say that a uprated tensioner doesn’t take the problem away. After stepping on the accelerator fiercely, the throttle cable jacket can pop out of its holder on top of the airbox. With this simple steel clip this can be prevented and it is fitted within seconds. 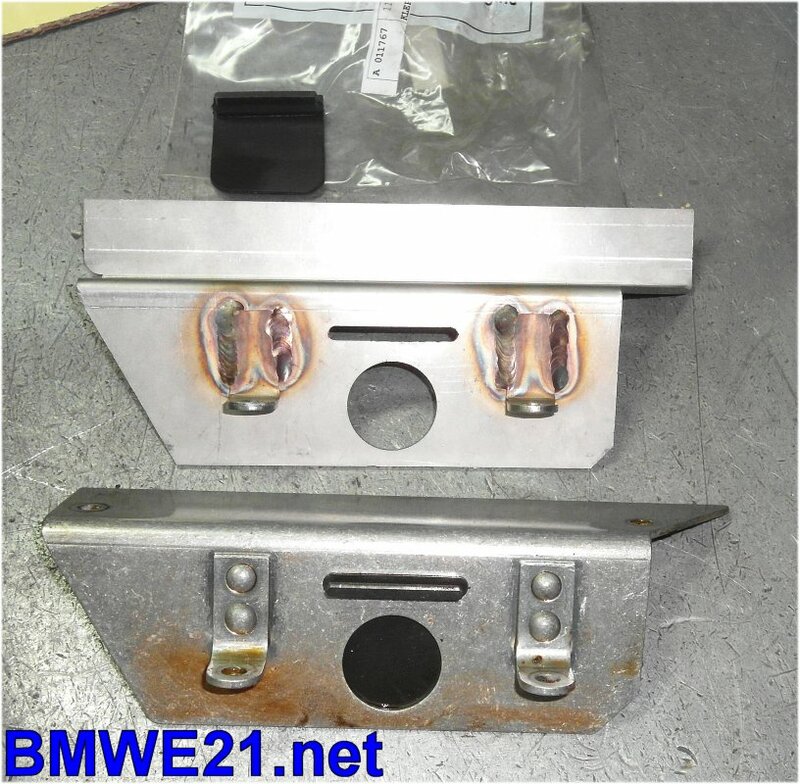 BMW part # 3540 1 165 393. If your car has cruise control you better fit two pcs. The 320iS basically shares most parts with the euro 325i rather than the M3, it also has the 4 stud wheels. My 320iS was on OEM BMW/Boge shocks all round when I bought it. OK stuff but I now fitted even better Bilstein B8 Sprints. The springs were the original Sportfahrwerk units. They lower the car only a little bit, my guess is about 12-15 mm. In this way it looks like the car has standard suspension, but these springs are pretty good already. A good upgrade is provided by Eibach with their Pro-Kit springs. They lower the car a bit more and improve high speed stability. The version for the 325i fits the 320iS perfectly. My front struts are equipped with new top bearings, OEM stuff. Usually they show some freeplay over time causing a knacking sound on bumps or when steering, that’s when you know they need replacing. Make sure to fit all the o-rings in the right order or you won’t make the best use of the bearing and cause excess wear. The rear stabilizer links didn’t look too good and were replaced by new aluminium examples. Based on the 325i suspension, the 320iS has the short links front and rear and it may be good to inspect them on dried out rubber and freeplay anyway. The rear shock mounts/bushings: the original ones look a bit thin. The E36 version fits perfectly and is larger and stiffer. Part # 3352 1 137 972. I recently heard that the E46 convertible mounts also fit and are even stiffer. And you can also fit Group N bushings (part # 33 31 1 417 247) although I’ve never tested the improvement in stiffness, but they are known to pass on more suspension/road noise. It it a good thing to place Z3 reinforcement plates at the top of the wheel well. One of my favorite upgrades is fitting bigger sway bars. They are more stiff, dramatically reducing body roll, but without making the suspension stiffer. In my opinion that makes the car more road worthy without having to move to extremely low or stiff springs: comfort remains maintained and achieving the same improvement in handling! I fitted a set of Eibach anti-roll kit sway bars and I didn’t set them to their most tight setting to maintain a friendly character even in the rain. But body roll is much, much less! I fitted the E30 M3 quick steering rack which was a straight swap. Solid and eccentric front control arm bushings (photo) and new front sway bar bushings. The new control arm bushes were a tremendous improvement in feel, steering and braking, all more direct and more communicative! On long and fast right hand turns like you encounter on several tracks for example, the oil pick up can be oil starved. A higher oil pan baffle can prevent that. Fitted this together with a larger oil filter (oem for M20 engines, standard procedure for me nowadays) and I haven’t seen any issues since. Last but not least I fitted the E24 gearbox bushings. Takes quite some ‘stock’ free play play out of the driveline (stock bushes are really soft even new) and makes shifting way smoother! Downside? More vibrations are passed on to the chassis but they don’t outweigh the tighter feel for me. This is an upgrade that doesn’t look too aggressive, especially if you paint it black like the original spoiler, like I did. It fits in the same clips and requires no further changes. It improves high speed stability (especially 180+ KMH). Carbon fibre airbox (as used in Germanys DTM). Produces a beautiful roar from the intake and improves air flow and torque tremendously. But… it also requires a different air flow meter combined with different engine management, like Alpha N. Expensive though! I choose for a carbon fibre airbox that fits the factory setup, so it uses the regular air flow meter. There is a second best option though: they are becoming rare but there are a few carbon fibre air collectors around that have the exact same shape as the stock example. Don’t expect improvements performance-wise but they are lighter, so easier on the TB gaskets, less weight at the front axle, and a more sporty sound, and looks! I found me one of these and for me it’s good enough as I don’t want to move too far away from the original setup. 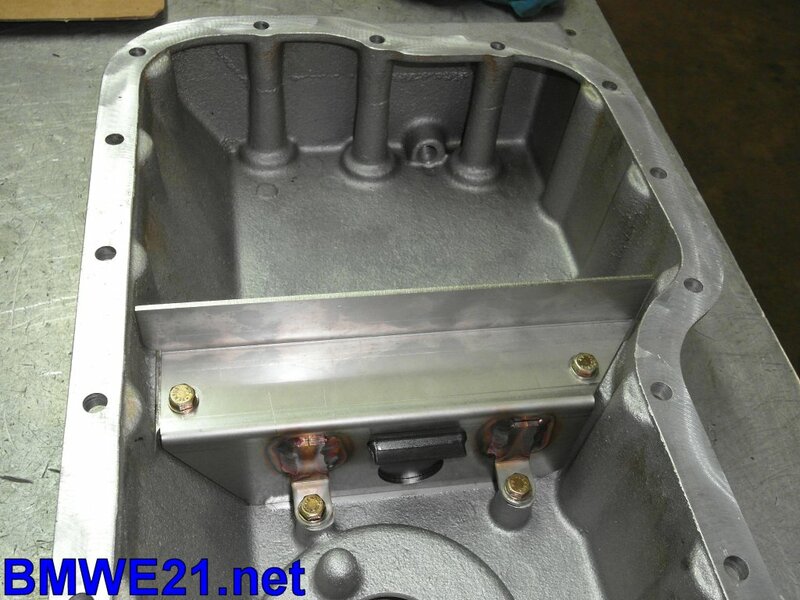 Here we also see the parts we know from the Euro 325i. Apart from a rebuild they are stock. The OEM rotors are supplied by Até. At the front I fitted Até PowerDisc rotors. They are the same discs as OEM equipment, but with oval slots. I upgraded brake pads from OEM to Ferodo DS2500, a good ‘fast street’ pad with better performance when hot and with more bite. There are several E30 big brake kits, but they all require 16” or 17” wheels and I want to stick to the current 15” wheels. Fitted steel braided brake hoses though! I used to have a three-piece single tube front brace, but I recently replaced it by a single piece dual tube example as they are more rigid giving a better effect. They seem hard to find but Dutch based Improve Tuning can help you out as they helped me out. Pro’s of a front strut brace: better high speed stability, sharper turn-in, eliminates instabilty caused by uneven roads or deep tracks in the asphalt. Cons: may cause more damage to the chassis on a front corner accident. No safety issue, it is just that one corner may push the other corner out of line as well. Haven’t tried a rear brace yet. The oil filter manifold is known to leak some engine oil. The oil thermostat cap is most likely to be the cause. I replaced the cap and its seal, but the oil pressure sender was also leaking. It is the same sender as in most contemporary BMW’s and as far as I know it is a common problem. The gasket between the oil filter manifold and the engine block is not a common weakpoint but definitely needs to be replaced when more than one bolt is undone. OEM spark plug cables, rotor and distributor are supplied by Beru-Bremi. Wear on rotor and distributor is easy to recognise. But as the spark plug cables are fitted in a narrow harness they tend to affect each other inside. It is advised to open the housing every couple of years for a check. The cables can be ordered through any Beru-Bremi reseller and come as a complete set, complete with the rubber cap over the ignition coil (even marked with BMW logo) and the wiring harness. BMW only recommends Bosch ‘Super 3’ X5DTC spark plugs only so there was no doubt for me there. Fit them with a torque wrench at abt 23-25 Nm. They perform really well and I have not noticed any improvements by using other brands or types. After the third coolant hose was ripped apart in a matter of weeks after I bought the car I decided to do something to prevent this from happening in the near future. The original coolant and fuel hoses were still in the car so it was about time to replace them. Since it were the hoses to radiator and thermostat that fell apart I reckoned the engine mounts could have something to do with it as well. I replaced these first, just OEM E30 M3 stuff. I removed the air filter housing with air flow meter, the air accumulator and the alternator to get some room. After that all coolant and fuel hoses in the engine bay were replaced. As a rule of thumb it is advised to replace the bearing shells after abt 200k kms. I did mine and I was happy to see the previous owners were just as careful as I am as wear was only minimal. Still you want to do this as a precaution, and I’ve seen much worse after less km’s! 320iS conrod bearings after 200k kms, not bad! And when in Rome… replaced the intake gaskets and all TB o-rings as well, followed by a full throttle body synchronization (both mechanically and on vacuum). All that work proved worth while… better idle especially when cold, and loads more mid-range and top end torque! Using digital slider measure to set mechanical accuracy over 10 times more precise than factory spec, with benefits!